Pitlochry, 스코틀랜드의 피틀로크리 백패커스 | 호스텔월드에서 예약하세요. Whether you are coming to Pitlochry to enjoy the vast array of outdoor activities or simply want to get away from it all and relax, we have everything you will need to ensure you make the most of your time in this beautiful Perthshire town. 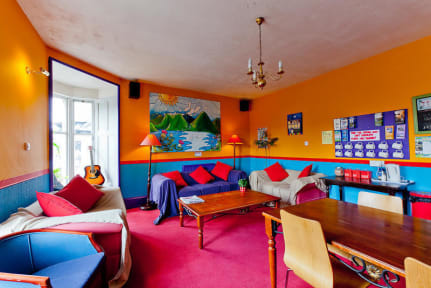 We have what we think is one of the best hostel lounge rooms in the country! Overlooking the street below, our bright spacious lounge has comfy sofas and as much free tea, coffee and hot chocolate as you can drink. It also has free WiFi, loads of local information, some games and musical instruments and a free pool table. We also have a separate Movie Lounge with comfy sofas and loads of films to choose from. It's a great place to meet likeminded people and although you might think you're only staying one night, you'll end up staying three or four - it's that kind of place! Our fully equipped self-catering kitchen has everything you will need to cook for you and your friends and there is a supermarket less than a minute away. We serve an optional breakfast for £3.00 for a 'wee bit of everything', (Cereal, toast, fruit juice, tea and coffee, fresh fruit and a freshly baked Scottish scone) or you can simply prepare your own. We offer a range of Dormitory, Twin, Quad and Double rooms. We have 6 Double Rooms En Suite, 4 Twin Rooms En Suite, 1 Family Room En Suite(Sleeps 4),1 Twin Room and 3 Quad Rooms (2 Bunk Beds), 2 x 5 Bed Dorms, 5 x 6 Bed Dorms and one 8 Bed Dorm. Our comfy beds come complete with fitted sheets, duvets and 2 comfy pillows and our private rooms have fresh towels included. We also rent towels and sell some toiletries at our main reception. There are several restaurants, cafes, pubs and shops just a stone's throw away and our staff can help advise you on the hidden gems of their town. Our staff can also advise on the fantastic activities available locally and can even call and book them for you. We have a bike and kayak shed available for storing your toys, a drying room for your soggy gear and we also offer a laundry service. 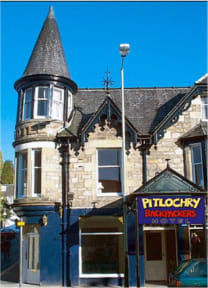 Our fantastic location in the heart of Pitlochry is only minutes away from both the railway station and the bus stop. Best of all it's literally a stroll away from the beautiful highland country-side. In just 5 minutes you can be at a tranquil loch-side with views through the trees to the hills above this gorgeous highland town. There are many wonderful walks to take; to waterfalls, along rivers, through ancient forests, or up Ben Vrackie (2760 feet, the hill above the town) - these walks all start from the hostel door! The area is also dotted with distilleries, castles and ancient standing stones all within easy reach. Perthshire is also a big centre for adventure activities, including white-water rafting, canoeing, bungee jumping, mountain biking and canoeing if you're up for it, or, simply get your boots and get exploring - there are some fantastic trails. The Pitlochry staff are a friendly bunch who know the surrounding area like the backs of their hands and are willing to help so don't be shy! Come and have a chat at reception and we can make sure you make the most of your time in Pitlochry. Unfortunately, due to past experiences, we are unable to accept stag or hen parties.